With some really useful functionality, this little German streamer certainly lives up to its name. Read our Raumfeld Connector. rom the electronics wing of German company Teufel, the Connector exists as a standalone source that allows an existing hi-fi setup to be integrated into a wider Raumfeld ecosystem. Like the other products here, it works perfectly well as an add-on streamer in its own right and has some useful functionality. The Connector handles all lossless formats – bar DSD – at sample rates up to 24-bit/192kHz. 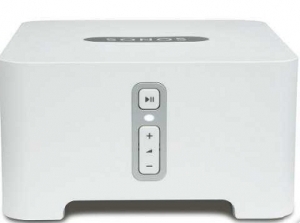 Wired and wireless connectivity is supported and there’s an analogue loop-through, which allows it to share an input with an existing source component, while the optical digital output allows you to use it with an external DAC. The Connector is supplied with a dedicated app (iOS and Android), which is a slick and effective piece of software. Like others here, it renders the library on the controlling device, which takes longer to compile but is stable once complete. As well as your music library, there is Spotify Connect support and Tidal integration. There’s no Bluetooth or AirPlay, but you do get Chromecast support built in. Having completed the simple setup and let the album library compile, the Raumfeld demonstrates more sonic character than some of the other streamers here and whether or not you like the effects of this will play a big part in how you get on with it. Adagio For TRON is presented with a small but appreciable lift to the upper mid and treble. This helps the sense of separation and perception of individual instruments, so as the piece builds it can feel a little sharper and harder than some of the other players. With the tonally darker recording of Dissolved Girl, the balance achieved is much more satisfying. There is a life and energy to the vocals that keeps them defined and distinct from the electronic accompaniment that underpins them. Bass isn’t the deepest here, but there is a speed and sense of agility to it that creates engagement with the listener. This also ensures the distinctive timing of Sinner In The Sea is delivered with assurance while highlighting the vocals and supporting instruments in a subtle but highly effective way. Raumfeld’s app is an effective piece of software and once it has compiled your music library, it turns in a solid performance thanks to a logical layout and reasonably swift responses. Tidal integration is very good and closely mimics the Tidal app so it works with the same underlying slickness as the rest of the platform. It isn’t able to access Tidal’s Master content, however, as there’s no MQA decoding onboard. Tuneln implementation is also effective. The search functions allow you to easily find specific stations and the performance with higher bit-rate stations is good. This also applies to Spotify Connect, which is susceptible to the slight brightness that the Connector imparts on some tracks.